Who says soup is for winter only? 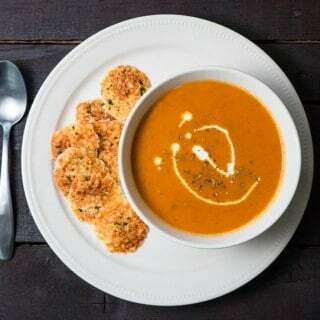 Our simple Tomato Basil Bisque with Parmesan Crisps is perfect for any time of the year. I love soup almost as much as I love chicken. All of nature’s goodness in a bowl ready to be slurped up with a spoon. It doesn’t get any better than that. On one of our weekday bike rides, Cody and I stumbled upon a beautiful nearby park with lots of tennis courts. We came home, googled the park and guess what?? It’s free! I love bread so much. Especially with soup. But as we all know, bread is not too great for your body, which is why we avoid it. 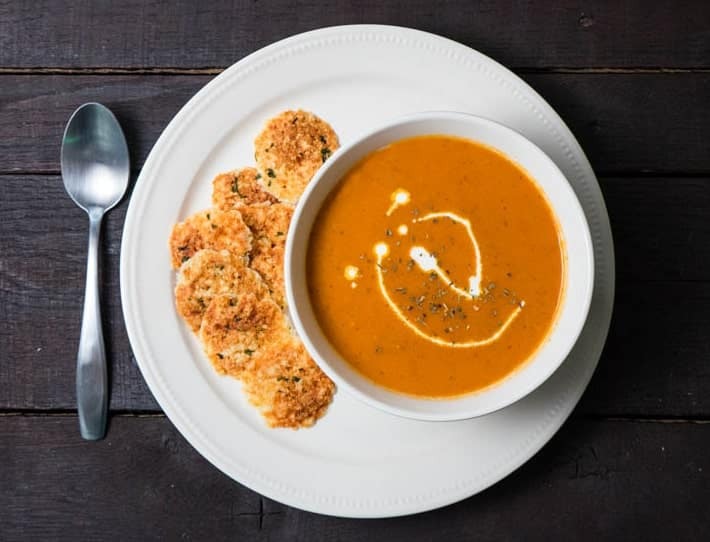 So, instead of bread, we made little parmesan crisps to dunk in our soup. They are basically just blops of shredded parmesan that got crisped up in our little toaster oven for a couple of minutes. It goes great with the soup and adds some lovely texture! Add the rest of the ingredients [except cream] and simmer for 45 minutes. Add soup back to the pot and stir in the cream.